This entry was posted in Devotional, Life's Struggles, Living, Short and sweet, Uncategorized and tagged Bible verse, broken, brokenness, Courage, Devotional, encouragement, faith, God, inspiration, Inspirational, Psalms, scripture, spiritual, Strength on April 18, 2019 by roushwm. The August sun beat down on Dad and me as we waited for the fish to surrender or make another run for it. Impatience bubbled up inside me. Holding on to my fishing pole kept my hands occupied but the rest of my body squirmed, longing to do anything but remain pinned against the sun baked boat seat. The life vest hanging around my neck made me hot and sweaty. The vest’s past history became evident as it wicked up the moisture from my body and produced a rotten smell. My standoff with the fish showed no sign of ending. The huge northern pike had done something to prevent me from reeling it in. My head hurt and I was ready to give up. “Dad, the fish isn’t tugging on the line anymore,” I complained. “That doesn’t mean its not there. Don’t give up,” Dad said trying to encourage me. My father wasn’t ready to give up. An engineer by profession, part of his job involved coming up with solutions to problems. He took an oar out of the oarlock and pushed it into the water following the fishing line down, hoping to gain some understanding of why I couldn’t bring up the fish. Unfortunately, the depth of the water exceeded the length of the oar. 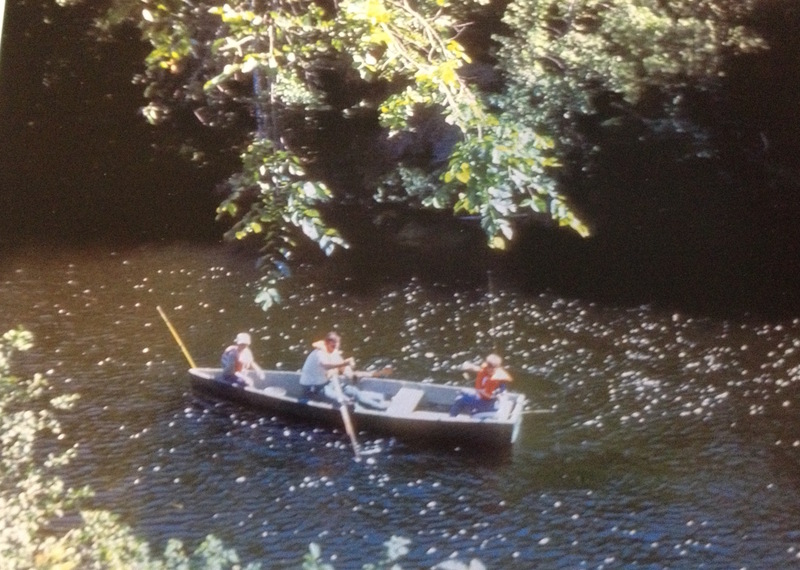 Dad also rowed the boat in a wide arc around the spot where the line plunged into the water. He stopped four or five times during the trek to give me a chance to pull on the line from different angles. Nothing he tried worked. We both knew there was only one thing left to do. “Billy, pull steadily on the line so you don’t break the pole,” Dad said, voicing his solidarity. “Like this,” I replied as I stood up and leaned back against the line. The tension broke before I had a chance to brace myself. I was pitched backwards by the sudden release of the line and landed in a heap between the seats. I didn’t cry as I reeled in the empty line. Instead, I felt more like one of Dad’s fishing buddies and less like a kid who got to sneak off early that morning to fish with his father. Fish or fishing in my earliest years validated the idea that just because something couldn’t be seen that didn’t mean it didn’t exist. Fish, though unseen, were real and could be interacted with. To this day one of the most exhilarating things about fishing is the feeling of an unseen object tugging on your line. Being a person of faith, the picture of unseen fish models the existence of God who is present though not seen. My fish story does not end here, however. The next decade of my life was one of drastic changes. Our family vacations to Canada continued. Fishing became truly a family affair. As our skill improved, so did the number of fish we caught. For me, fishing with Dad became an important way of relating to him. Those carefree years came to an abrupt end, however, when I graduated from high school. I no longer had time for family vacations. Holding down a job and going to college were my priorities now. The remaining years of my second decade afforded me little or no time for fishing. In my second year in college I happened to meet a freshmen who turned out to be a very funny guy. I don’t make it a habit of hanging around comedians but for some reason we hit it off and become good friends. He made me laugh more than anyone I knew. Our definition of fun, however, sometimes clashed with the college rules. In an effort to protect his identity, I’ll call him Boris. Boris and I made plans to room together our senior year. Oops, I just gave away his identity. Anyway, we arrived early on campus in the fall and immediately began decorating our “bachelor pad.” Because we arrived early, we were able to pillage the best room furnishings out of nearby dorm rooms. Conversations between us went something like this. “All my stuff is here,” he countered. “You mean besides the stereo, speakers, sofa and television?” Boris said. This was 1979, before the widespread use of cell phones, personal computers, flat screen TVs and all of the game consoles we can’t seem to live with out. “How about a lamp?” He said, chuckling as only Boris could. His cackle was contagious and soon he had me laughing. “Let’s go down and take a look at brother Jim’s room.” Boris said pressing his palms together as if to portray himself as a wise sage. Boris was studying to be a minister and often got carried away with the whole brother/sister thing. “What does Jim have that we don’t?” I said, suddenly curious. We went down the hall to Jim’s room but he was not there. His door, however, was slightly ajar. I had just recently met Jim but already I had him pegged as a bit of an eccentric. Living in a dorm, it had been my practice to give eccentrics a wide birth until I understood them better. Boris knocked hard on the heavy oak door, hard enough to make it open completely. “Brother Bill, shall we enter?” Boris stated like he was rolling out a welcome mat. “Can’t we get in trouble for doing this?” I said more afraid of being misunderstood by Jim than anything else. I should explain that each floor in our dorm had a resident advisor, or RA, who was the liaison between the students and the dorm’s resident director, or RD. Boris was permitted to enter rooms on our floor as part of his responsibilities. Tentatively, I entered Jim’s room and Boris followed. “What do you think?” Boris said, gesturing towards the aquarium in the back corner of the room. “Are you working for the FBI now?” Boris said sarcastically. “What kind of fish do you suppose those are?” he inquired, taking a closer look at them. I can’t remember exactly how we acquired a fish tank, but I’m sure we did it legally. Putting fish in an aquarium drew me closer to them, close enough where I could fully appreciate their beauty. I felt a part of their world as they swam by me at eye level. It’s a much different perspective than viewing fish from afar or looking down at them from above. I would characterize this decade of life as the discovery of genuine relationships. These were more personal and fulfilling than the juvenile ones of my earliest years. I fully immersed myself in these relationships and learned the joy of putting effort into them rather than just taking what I could out of them and moving on. Spiritually, I was going through a major transition as well. As a child I believed in God because my parents did. It was their faith I held on to. In my second decade of life I discovered the beauty of a God who didn’t look down on me from above, rather his habitation was with me. He became my God. As wonderful as this realization was, I was unprepared for what was about to happen. This entry was posted in Devotional, Fishing, Living, Writing and tagged Aquarium, college, comedy, Devotional, dorm, Dorm Life, faith, family, fish, Fishing, God, Roberts Wesleyan College, roommate, RWC on March 25, 2018 by roushwm. (33) “Follow it to the end” – this section of the 119th Psalm speaks about finishing well. God’s help is needed for us to stay the course and finish well. (37) “Turn my eyes” – our eyes have an appetite, we need to guard what they are focusing on. (41) “Thy salvation” – deliverance from the evil that is revealed to us in God’s word. (48) “I will lift up my hands” – how many of us can say that we reach out for God’s word like a child reaches for a gift (Spurgeon). Matt Chandler in his video series on Psalm 119 titles this section, “Cause Me.” Our prayers should reflect two ideas: (1) to love what is good (give me an appetite for God’s Word) and (2) to hate what is evil (my selfishness can be a source of evil). Studying God’s word positions us to do both. My prayer: Cause me to be certain of my faith, cause me to be thirsty for Your word and cause me to finish well. This entry was posted in Devotional, Psalms, Uncategorized and tagged Be certain, Bible, Cause me, faith, Finish, God's word, inspiration, Psalm 119, religion, truth on January 6, 2018 by roushwm. This entry was posted in Holiday, Poetry and tagged Annie and Willies prayer, Christmas poem, faith, family, inspiration, Jesus, prayer, Sophia P Snow, The reason for the season on December 23, 2017 by roushwm.